(Newser) – The first national museum devoted exclusively to the history and culture of African-Americans is now open, the AP reports. 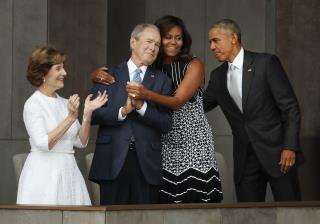 The Obamas opened the new Smithsonian National Museum of African American History and Culture on the National Mall by ringing a bell from a historic African-American church. The museum is the 19th and the newest of the Smithsonians. The push for the museum began in 1915 with African-American Civil War veterans looking for a way to commemorate America's black experience. Former President George W. Bush signed the law authorizing its construction in 2003. Georgia Congressman John Lewis co-sponsored legislation authorizing the museum. The civil rights icon said the bronze-colored museum "is more than a building, it is a dream come true." How about a White History Museum? White College Fund? National Association of White People? It took a 100 years and look who got it done. A POS Muslim terrorist. Oh! Look at all that love in a photo! I bet two of them are comparing scores over coffee on how many children they killed in Mideast. Brilliant!